Primarily a problem in the landscape on taxus and rhododendron. 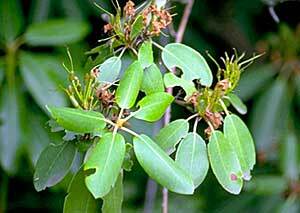 It can also be found on several other broad-leaved evergreens including azalea, mountain laurel (Kalmia), and Euonymus. Adults feed along leaf/needle margins leaving distinctive hemi-spherical notches. Larvae feed on the fine roots of the host plant in the fall and on larger roots in the spring. Larvae may girdle the main stem below the soil line. Leaves will yellow and plants may be stunted or die. 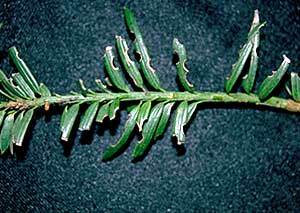 Larvae cause the greatest level of injury to the host plant. Larvae are off-white with a brown head and are approximately 1/4" inch long when fully developed. Larvae are similar to grubs (as in the Scarabaeidae). Although, black vine weevil larvae lack the distinctive thoracic legs and are only slightly "C" shaped. The adult black vine weevil is black with subtle white flecking, oblong, 3/8 of an inch long, and has a short snout. All are female and unable to fly. The black vine weevil overwinters in the soil as a partly grown larva, or "pre-pupa". Larvae resume feeding on roots in the early spring, causing the heaviest damage. Larvae pupate in late May and June for about 10 days. Adults begin emerging in June (600 GDD) and continue through July. Adults feed at night and hide around the base of the plant during the day. After two to three weeks of feeding, egg laying begins, usually in late July (approximately 1400 GDD). Larvae hatch in August (Approximately 1700 GDD) and begin feeding on roots. They continue to feed and grow until winter. 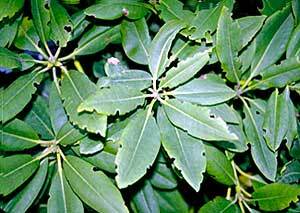 Monitor for the adult damage to host plants in March through November by inspecting the foliage for notching. This indicates weevil feeding during the previous growing season. At the end of May, 300-450 GDD, use a 2x3' burlap square folded into 4" pleats and placed snugly around the base of a plant. When adults crawl to the base of the plant before daylight, they will settle in the pleats of the burlap. 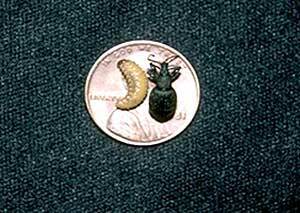 In mid June (600 GDD) through August (2000 GDD) inspect traps weekly and collect adult weevils. Continue trapping until the traps cease to produce any new weevils for at least two weeks. Inspect for any new notching. Direct extra attention to the lower foliage; these weevils crawl and cannot fly, therefore, the foliage on the lower portion of the plant will be injured first. Use burlap traps to collect and destroy adults before egg-laying begins around individual plants. Entomopathogenic nematodes work well against spring larvae in container stock and may work well in the field but results in the landscape have been varied. Best results occur with entomopathogenic nematodes if the soil has received at least 1" of water prior to application and then kept moist for 4 - 5 days after application. Note that new infestations are often introduced into the landscape by bringing in infested nursey stock.